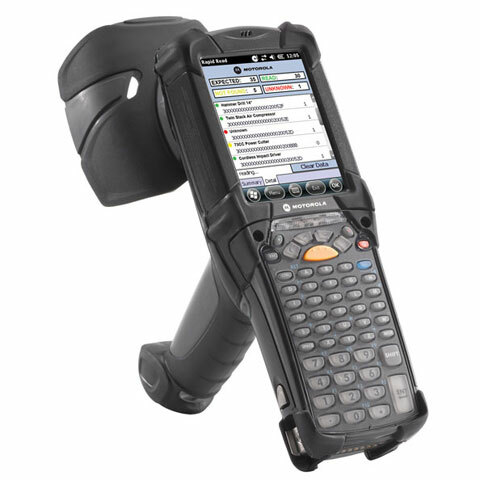 he MC9190-Z is Zebra's new best-in-class standard for handheld RFID readers. With its high RF sensitivity that provides for greater accuracy, higher throughput and longer reads, the MC9190-Z reaches further to bring reliable data about your products right to your fingertips. Inventory counts can be accomplished more often, more quickly and accurately and, unlike scanning with barcodes, without line of sight. Then, armed with more complete information, you can better locate and track assets and inventory, and manage your stock levels to avoid running out of product or carrying expensive excess inventory. Wi-Fi (802.11a/b/g), RFID Reader, Handheld, 2D Direct Part Marking (DPM) Imager Scanner, Color, 256MB/1GB, 53 key Keypad, Windows Mobile 6.5, Bluetooth, US Frequency-based. Interface cables and charging cradle sold separately. Single slot charging cradle kit (Part# CRD9000-110SES). Quad slot charging cradle kit (Part# CRD9101-411CES) requires AC line cord (Part# 23844-00-00R). Wi-Fi (802.11a/b/g), RFID Reader, UHF, Handheld, 2D Imager Scanner, Color, 256MB/1GB, 53 key Keypad, Windows Mobile 6.5, Bluetooth, US Frequency-based. Interface cables and charging cradle sold separately. Single slot charging cradle kit (Part# CRD9000-110SES). Quad slot charging cradle kit (Part# CRD9101-411CES) requires AC line cord (Part# 23844-00-00R). Wi-Fi (802.11a/b/g), RFID Reader, Handheld, 1D Laser Scanner, Color, 256MB/1GB, 53 key Keypad, Windows Mobile 6.5, Bluetooth, US Frequency-based. Interface cables and charging cradle sold separately. Single slot charging cradle kit (Part# CRD9000-110SES). Quad slot charging cradle kit (Part# CRD9101-411CES) requires AC line cord (Part# 23844-00-00R). Wi-Fi (802.11a/b/g), RFID Reader, Handheld, 1D Extended Range (LORAX) Laser Scanner, Color, 256MB/1GB, 53 key Keypad, Windows Mobile 6.5, Bluetooth, US Frequency-based. Interface cables and charging cradle sold separately. Single slot charging cradle kit (Part# CRD9000-110SES). Quad slot charging cradle kit (Part# CRD9101-411CES) requires AC line cord (Part# 23844-00-00R). RFID handheld, 802.11a/b/g, Extended Range (Lorax), Color, 256MB/1GB, 53 key, Windows Mobile 6.5, Bluetooth, ETSI 302-208. Interface cables and charging cradle sold separately. Single slot charging cradle kit (Part# CRD9000-110SES). Quad slot charging cradle kit (Part# CRD9101-411CES) requires AC line cord (Part# 23844-00-00R). RFID handheld, 802.11a/b/g, 2D Direct Part Marking, Color, 256MB/1GB, 53 key, Windows Mobile 6.5, Bluetooth, ETSI 302-208. Interface cables and charging cradle sold separately. Single slot charging cradle kit (Part# CRD9000-110SES). Quad slot charging cradle kit (Part# CRD9101-411CES) requires AC line cord (Part# 23844-00-00R). 2D Imager, RFID Reader, 53 key Keypad, Windows Mobile 6.5, Bluetooth, CN Frequency. Interface cables and charging cradle sold separately. Single slot charging cradle kit (Part# CRD9000-110SES). Quad slot charging cradle kit (Part# CRD9101-411CES) requires AC line cord (Part# 23844-00-00R). Wi-Fi (802.11a/b/g), RFID Reader, Handheld, 2D Imager Scanner, Color, 256MB/1GB, 53 key Keypad, Windows Mobile 6.5, Bluetooth, US Frequency-based, ETSI 302-208. Interface cables and charging cradle sold separately. Single slot charging cradle kit (Part# CRD9000-110SES). Quad slot charging cradle kit (Part# CRD9101-411CES) requires AC line cord (Part# 23844-00-00R). RFID Handheld, 802.11a/b/g, 1D Scanner, Color, 256MB/1GB, 53 key, Windows Mobile 6.5, Bluetooth, ETSI 302-208. EU Freq. Interface cables and charging cradle sold separately. Single slot charging cradle kit (Part# CRD9000-110SES). Quad slot charging cradle kit (Part# CRD9101-411CES) requires AC line cord (Part# 23844-00-00R). 4-Slot Charge Only Cradle Kit: Includes cradle, power supply, and DC line cord. US AC line cord (Part# 23844-00-00R) sold separately. 4-Slot Ethernet Cradle Kit: Includes cradle, power supply (PWRS-14000-241R), DC line cord (Part# 50-16002-029R) and US AC line cord (Part# 23844-00-00R).